The Calling of the Apostles Peter and Andrew (from the Maestà), c. 1308–1311. The case of Simone Martini and Pietro Lorenzetti is somewhat different. 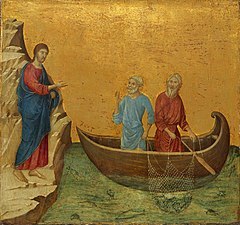 These two artists painted works that have affinities with Duccio: for Simone from about 1305, and Pietro from about 1310 onwards. However, from the outset their work showed distinctive individual features, as can be seen in Simone's Madonna and Child no. 583 (1305–1310) and in Pietro's Orsini Triptych, painted at Assisi (about 1310–1315). Later the two developed styles with completely independent characteristics such that they acquired an artistic standing that elevates them well beyond being labelled simply as followers of Duccio. 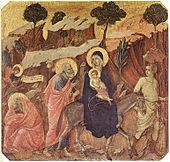 See also: Category:Paintings by Duccio. Madonna with Child, c. 1300–1305. ^ Gordon, Dillian (28 July 2014). "Duccio (di Buoninsegna)". Oxford Art Online. Archived from the original on 2016-12-30. Retrieved 10 February 2017. ^ a b Smart 1978, p. 39. ^ a b "Madonna and Child Duccio di Buoninsegna (Italian, active by 1278–died 1318 Siena)". Metropolitan Museum of Art. Retrieved 10 December 2012. ^ Smart 1978, p. 40. ^ Polzer, Joseph (2005). "A Question of Method: Quantitative Aspects of Art Historical Analysis in the Classification of Early Trecento Italian Painting Based on Ornamental Practice". Mitteilungen des Kunsthistorisches Institutes in Florenz. 49: 33–100. JSTOR 27655375. ^ "Triptych: Crucifixion and other Scenes c. 1302–08". royalcollection.org.uk. 2018. Archived from the original on Apr 11, 2015. Retrieved Jul 27, 2018. ^ Christiansen, Keith. "Recent Acquisitions, A Selection: 2004–2005." Metropolitan Museum of Art Bulletin 63 (Fall 2005), pp. 14–15, ill. on cover (color, cropped) and p. 14 (color). ^ "The Crucifixion; the Redeemer with Angels; Saint Nicholas; Saint Gregory, 1311–18, Duccio di Buoninsegna (Italian (Sienese), active in 1278, died by 1319)". Museum of Fine Arts Boston. Retrieved 24 December 2016. Beck, James (2006). Duccio to Raphael. European Press Academic Publishing. ISBN 8883980433. Smart, Alastair (1978). The Dawn of Italian Painting 1250–1400. Oxford: Phaidon. ISBN 0714817694. Bellosi, Luciano (1999). Duccio: The Maestà. New York: Thames and Hudson. ISBN 9780500237717. Bellosi, Luciano; Ragionieri, Giovanna (2003). Duccio di Buoninsegna. Giunti Editore. ISBN 9788809032088. Jannella, Cecilia (1991). Duccio di Buoninsegna. Scala/Riverside. ISBN 9781878351180. 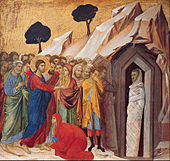 Wikimedia Commons has media related to Duccio di Buoninsegna. Wikisource has the text of the 1913 Catholic Encyclopedia article Duccio di Buoninsegna. "Duccio di Buoninsegna" . The New Student's Reference Work . 1914.